10:32pm – Housemates are having their dinner. 10:09pm – Housemates exit the arena after their presentations. 6:23pm – Housemates exit the arena and get back inside the house. 6:22pm – The Airtel Penalty challenge comes to and end. 6:01pm – Lolu is taking part in the Penalty challenge first. 5:55pm – The housemates are in the arena for a Challenge called “Airtel Goals for Education” & it’s Sponsored by Airtel. 2:14pm – Cee-C and Nina are seated in the garden having a conversation, it seems like Cee-C is giving Nina some relationship advise. 12:24pm – Head of House Alex reads out a task brief to her fellow housemates who are all gathered in the lounge. 11:40am – Lolu is quietly seated alone in the lounge. 11:27am – Majority of the housemates are now sleeping. 10:50am – Tobi and Alex are in the luxury bedroom having a conversation. 9:52am – Housemates have began having their breakfast. 9:19am – Housemates are having showers and cleaning themselves up. 8:51am – Housemates morning workout session comes to an end. 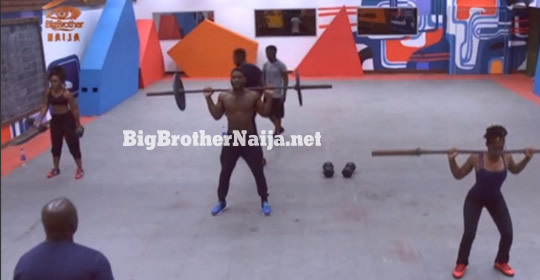 7:55am – The housemates are in the arena taking part in their morning workout session. 7:24am – Housemates have started waking up one by one. Good morning to you all and welcome to day 73 of Big Brother Naija Season 3, follow today’s Live Feed Blog for all the latest updates. You can as well check out yesterday’s highlights Here.